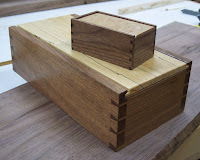 I love to hand cut dovetails and I love boxes, so when I found a little piece of birds-eye maple in the basement (my former shop) I decided to make a miniature version of a box I made a few years ago, one with a sliding lid. The little one measures 4" long. 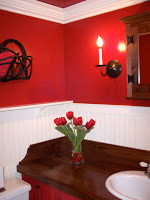 So, about 4 years ago, I decided to rip out the guest bathroom and rebuild the whole thing. The old design, and I regret not having taken a photo, was circa 1950, but without the cool kitschy look. ...3 years later, I came back to the bathroom project. A friend said "Hey, you're a woodworker, you should make a wood counter." Good idea. 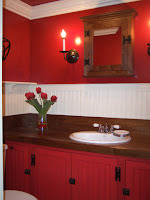 So, I finished the bathroom and built a walnut counter, a walnut medicine cabinet, 4 frame & panel bead board cabinet doors, a little shelf, and installed bead board wainscoting. This being my first attempt at installing crown molding, I chose the widest crown molding I could find...and decided to cope the corners. (For those who do not know what coping is, it's sufficient to say that it is a really masochistic task to give oneself, given the width and complexity of this particular molding). By the last corner, I had finally figured out what I was doing. Of course, in order to view that corner, it requires a Linda Blairesque twist of the head. Last night was the yearly business meeting for one of the woodworking clubs to which I belong, and of which I am the only woman. For three years, I created the club's newsletter and have been an active member since its beginning, about 6 years ago. Last night, when no one offered to become the new president, the current VP chimed in with what was the [figurative] equivalent of "Tag, you're it!". My "buddies" threw me under the bus. But there will be retribution, oh yes, there will. My first order of business will be to make the rule that all members will address me as "Her Most Excellent and Highly Revered Majesty." 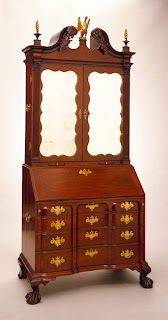 My partner and I, along with our friend, Scott, toured the Winterthur Museum in Delaware yesterday. I'm not a big fan of this type of furniture, but have enormous respect for the hours of work and talent that went into its construction. 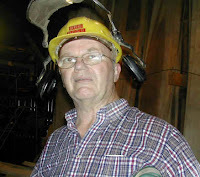 The other reason I went on the tour was the promised behind-the-scenes inspection of the Dominy workshop. Crowded in the small shop with 12 other antique tool lovers, I saw up close some wonderful bench planes, a wooden saw set, 2 lathes, user-made frame saws and a user-made band saw (that worked off the pole lathe), molding planes, whale bone spokeshaves, and various jigs. One jointer plane, which was about 2' long, was in such good condition it was impossible to believe it was over 200 years old. Here are some of the women from the club working on a bookcase that will be donated to a local women's shelter. Our club was founded last October and we've had demos and workshops on pen turning, handcut dovetails, sharpening, carving, and handplanes, just to name a few. There are about 12 women in the club; a small, but enthusiastic group! 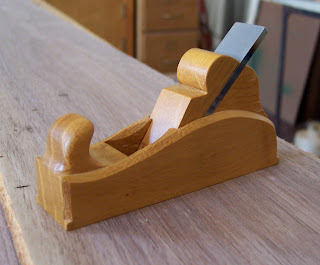 I love miniature handplanes and picked up an old user-made one at the dealers' show at the Brown International Tool Auction earlier this year. The antique is in the background and my reproduction is in the foreground, made from Osage Orange. 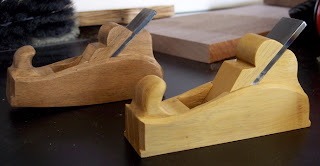 The main difference in shape between my plane and the antique is the sole. The original has a curved sole while mine is flat, since I normally build projects with flat surfaces. I also made a longer wedge so that the curve at the top edge of the wedge connects with and follows the curve along the back of the plane. The other thing I changed was the thumb hold at the front of the plane. This I beefed up since I noticed a tell tale glue line on the original that indicated it had broken off at some point. The length is 4". A tiny plane, but it still took me 14 hours to make, but that's including grinding, heat treating, and sharpening the blade. After 5 months, the Osage Orange has taken on a beautiful amber color. I expect it will continue to get darker and richer until it becomes a very dark brown. 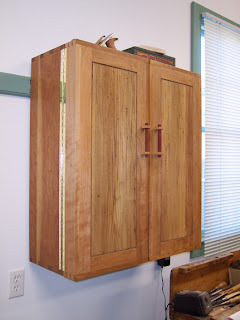 This cabinet has been a many year project and still is incomplete. Woods used are cherry, wormy chestnut, walnut, and bloodwood. 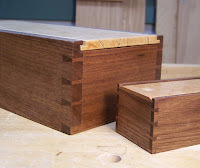 The carcase is joined with handcut dovetails, as are the doors. 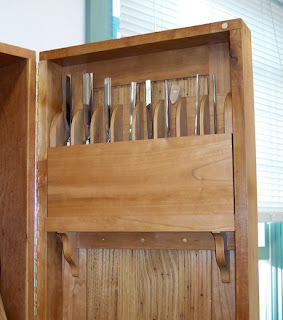 The chisel racks rest on little shelves and are held in position with cherry turnbuttons. 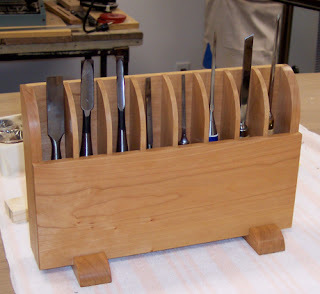 The chisel racks are removable and can sit on a workbench with "feet" to hold them upright and stable. 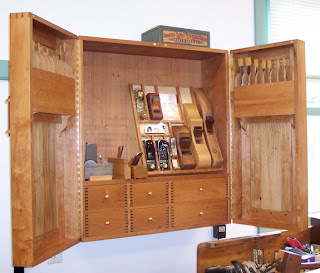 I plan to build other tool holders for placement inside the doors and in the back of the carcase. 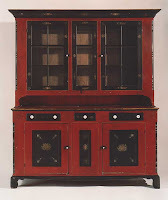 The cabinet is attached to the wall with a French Cleat. Here's hoping it's a strong support! My beloved workshop, added in 2004. 630 sq. ft., 10 ft. ceilings. I've had the privilege the past couple of years to teach various woodworking classes at our local Woodcraft Store. Until recently, all my classes were restricted to women only, however I opened the class on handcarved lettering to both men and women. As it turned out, only men signed up....and what a difference in their demeanor compared to the women. Permit me to describe a women-only class. First, they're smiley. Second, they immediately strike up conversation with one another before we get started on the class. Once the class is underway, they are polite and crack jokes, mostly self-deprecating, and sometimes go off on tangents unrelated to woodworking. Other times, they are quick to share a woodworking experience of their own. One thing's for sure, there is much jocularity and hilarity. After one class, the guys working in the store commented to me that they could hear us laughing through the closed shop doors. They mistakenly thought it was due to humorous stories I was sharing rather than the women carrying on themselves. I chose not to correct them. Now for the men. Night and day. Certainly polite, in fact, very polite, but not a peep of interaction between them. They were set on learning a new skill and focused all their attention on that one task. It was so quiet, the Woodcraft guys kept poking their heads in to make sure we weren't sleeping. It was peaceful, mindful, Zenful (is that a word? ), and I came home for the first time from teaching a class not completely worn out. My next class is Power Tools for Women. I hope I'm high-energy that day! *Disclaimer: I write all this in kindness. It's great to teach both men and women, especially for their differences!